One may call it differently, in several parts of this mystical country but mostly “Vasant Panchami” what this festival is better known as. All ocassion, one needs to collect puja samagri. In many parts, it is also celebrate as ‘Basant festivals of Kites”. Sikhs in Gurdwaras celebrate Vasant Panchami as “Sikh Festival”. Whereas in the state of Bihar, this day is dedicated to all the farmers, popularly known as ‘Harvest Festival’, Some of the other parts in India, it is the anniversary of “Deo-Sun God’. The occasion is the same, it is just that it is celebrated with different rituals and different customs. This shows that people always have a different way to celebrate an occasion but the essence remains the same everywhere. In wide parts of Bengal, this day is particularly special for Bengalis because it’s the day when Saraswati Puja is commenced with great pomp and Glitter. When different parts of India Celebrating this day as “Vasant Panchami”, in the eastern part of Indian and in the state of West Bengal, this day is widely celebrated by worshiping the Goddess Saraswati. This is one of the major festivals for Hindus and holds a deep significance in their life. Some say this festival is a reason to bid goodbye to the winter vibes and a way to welcoming the Spring season. Some even for presenting divine gifts online to their dear and loved ones. One of the primary and important aspects of Vasant Panchami is, that it is majorly dedicated to laying a foundation for the education department on how to read and write. 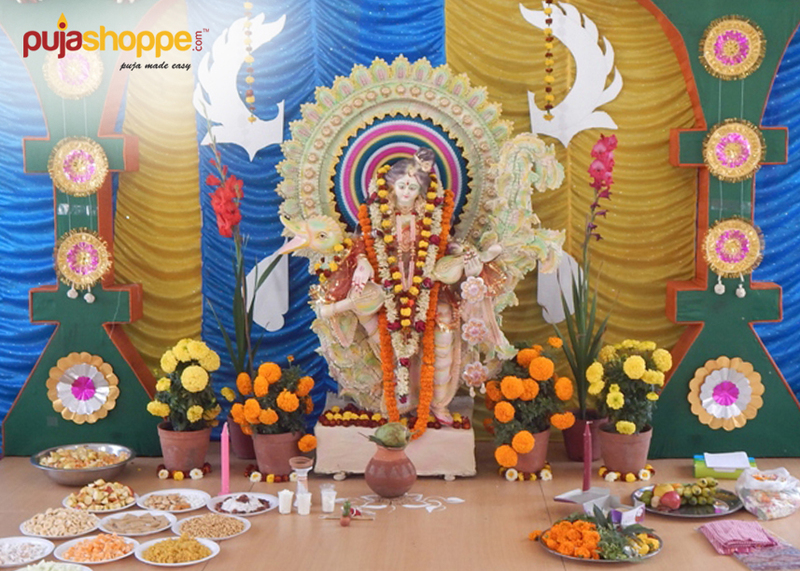 Saraswati puja is special for schools and household people. This day also marks their very first lesson in reading and Writing. During this day of Vasant Panchami, Goddess Saraswati is being hailed all over. Mainly form the students of colleges, schools, music, and arts from all nations. It is the only day when students from different learning institutes completely engage themselves in worshiping her. This day they completely dedicated their day to praise and hailing her. Some of them believed that the mahurat of Vasant Panchami is extremely lucky to start any fresh work, any ritual work or taking a major step towards something really big. It works as a lucky mascot for them who really believe in its significance. Some Astrologers even term as, ‘Abuja’ stating that is auspicious to start a something new. In the eastern part of India, one can also this is only they even go for house inauguration or Griha-Pravesh, thread ceremony, wedding, and many other occasions. There’s always something to celebrate and worship, specifically in our Hindu customs and rituals. And every occasion comes there will be some Puja for sure. For all Puja Samgris, one can visit and shop with “Puja Shoppe“. India’s only a few online outlets for puja items, gift, idols and many more.